was paid to every design feature. The image quality of The Buck is optimized by the use of our one piece tube design which provides the foundation for precise lens alignment and a secure mechanical housing for the zoom assembly and other stationary elements. This allows the hunter to see deep into the shadows of early dawn and late dusk, so your hunting day can start a little earlier and last a little longer. The extra-wide field of view gives the shooter a much higher sense of confidence when viewing the target, especially when it's moving game in heavily-wooded areas or dense cover. 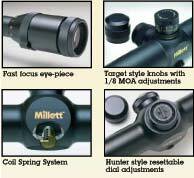 These scopes provide superior accuracy and durability to withstand the most severe field conditions. The Buck Lightening perfectly illuminates the center of the cross hair when poor lighting conditions make it difficult to see the center of your reticle against the target. The illumination is fully adjustable with eleven settings for brightness. 1. Heavy Duty one piece main tube, provides the foundation for precise lens alignment and other components. 2. Shock-proof scopes need to absorb the heaviest recoil and field handling conditions without failure. The soft mounting of lens assemblies and zoom pivot, are protected inside the heavy walled tube. 3. The reinforced variable power zoom ring serves to seal and support the eyepiece securely. over the life of the scope. throughout the windage & elevation adjustment range. 6. Resettable dials are provided in both windage and elevation adjustments to retain sight calibration and easy return to zero. 7. Finger touch controls eliminate the need for coin slots. The fine clicks are graduated to produce 1/4 minute of angle corrections. 9. Parallax is controlled by the precise construction of zoom components that eliminate lost motion. This preserves the sharp focus at high, mid-range and low power. The accurate fits in sliding lens housings, zoom drive slots, and cam followers guarantee superior parallax elimination and reduce point-of-impact shifts throughout the zoom range. 10. Stray or flare light, that may reduce contrast and affect the image quality, is controlled by the use of our light baffles and anti-reflection coatings.